This week's episode was especially heavy on thematic parodies, beginning with a Hellvetica Standard (not a typo...) and featuring two scenes making fun of sports anime. It was also revealed that, almost as a rule, Tachibana's friends were also as strange and random as the comedy trio of Mio, Yukko and Mai. Thinking about it, though, this episode had appearances of these "main characters" in abundance; I feel almost needy to say that, even though I asked for more and more random characters, it still feels really good to pay attention to the mains every once in a while. Lack of sight causes extreme irritation for me too. As if absolutely punning the strange (but quite interesting) Helvetica Standard from last episode, this one began with a Hellvetica Standard short. 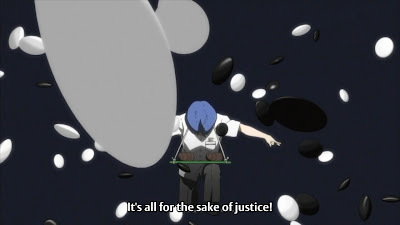 I was immediately drawn into the episode; any show that can poke fun at itself (and do it well) is always a plus for me. 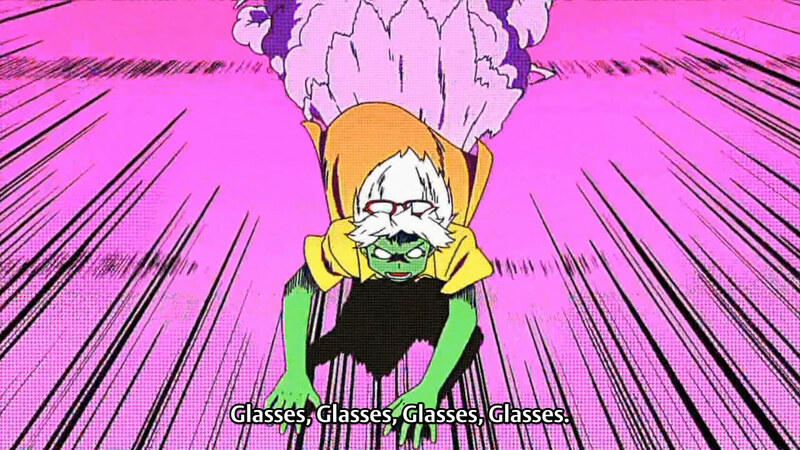 Making fun of the "megane" trope, the scene featured a demon chasing after a man while his attack seemed to consist of scraping his hands against the ground (while looking for the glasses that were on his head, of course). 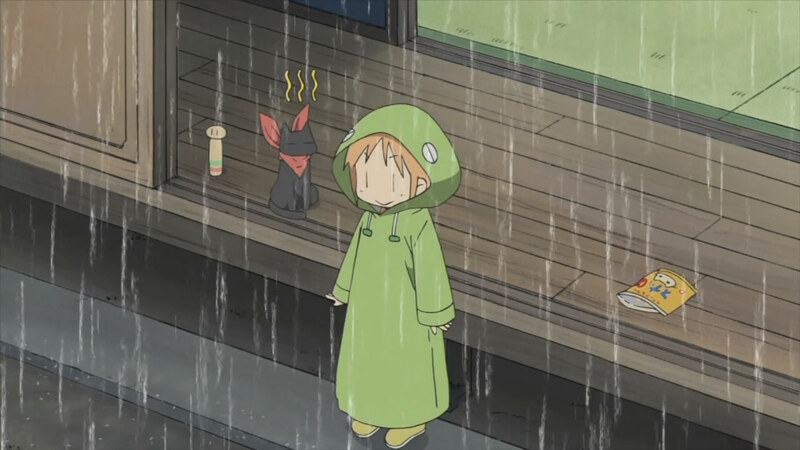 Next was a short scene of Tachibana and her two unnamed friends, taking shelter from the rain under an awning. (There's a good chance they were named in a scene long prior; I just don't remember them.) 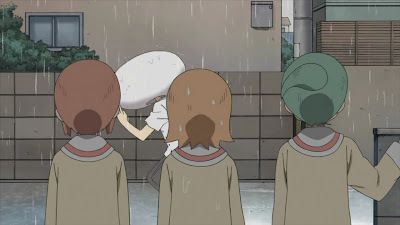 One of them, called "Fec-chan", was doing ridiculous things under the guise of "humour", such as running out into the rain, saying "Domestic violence," and then running back in. I can't say much about these friends; they seem a lot more laidback than the three that are usually shown (as in, they don't have extreme reactions), but that might all change. 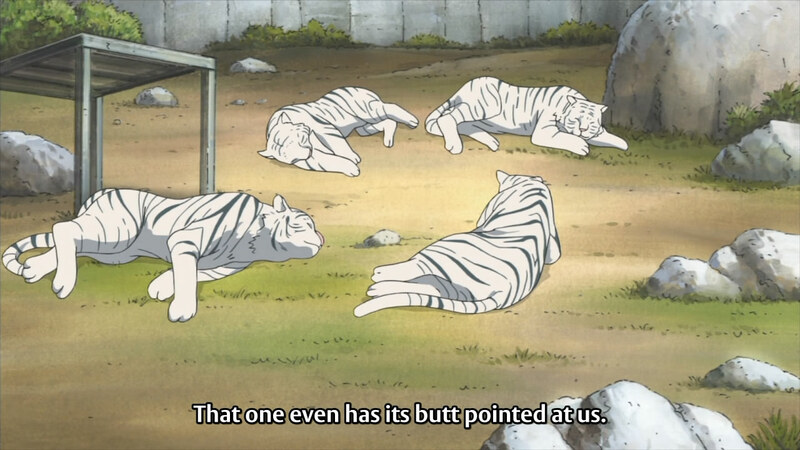 People in this anime seem to be of an entirely different breed, after all. 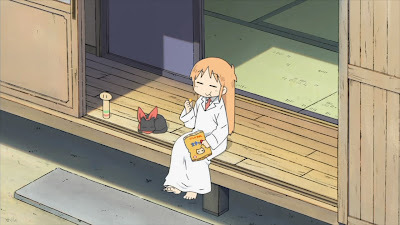 After a scene with Nakanojo's father lecturing the newcomer about how to properly be Daifuku-kun, Mio and Yukko were seen practicing the former's running high jump in the school field. This was the first of the two scenes that made fun of sports-focused anime. Mio, who had a ridiculously difficult time doing the jump properly (in the first instance, shooting straight under the bar), was apparently "average" in sports, but lacked the focus to understand and follow rules. I fail to see how she's average, given the feats she did in the montage, but the scene was essentially a very long parody. 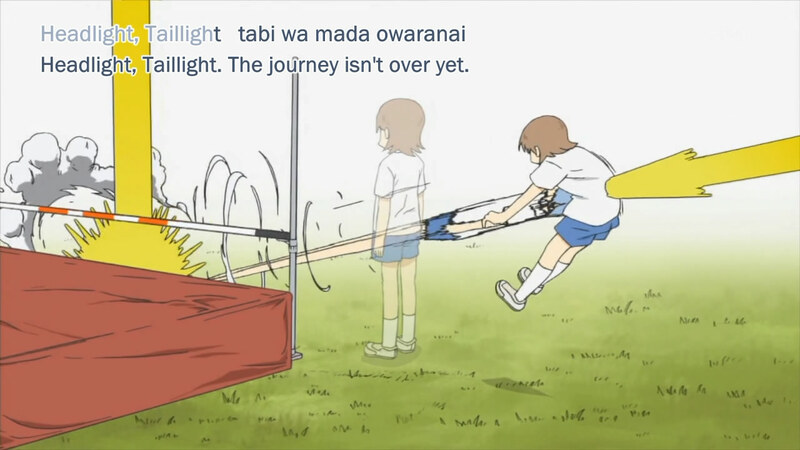 When Yukko promised to be there until Mio got it (because she was always copying Mio's homework in the past), the "a capella" insert song begun, accompanying Mio's run (which took a super long time, as it should). There was even a scene of a disheartened Mio crouching on the ground and an extremely old-school guy showing up (love interest? rival?) to boost her confidence. 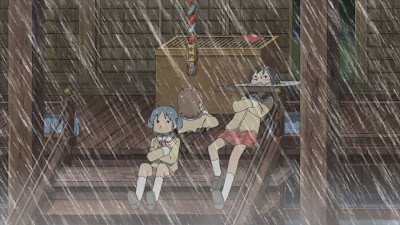 In the end, she still didn't get it, bashing straight into Yukko instead. Afternoon naps look so comfortable. 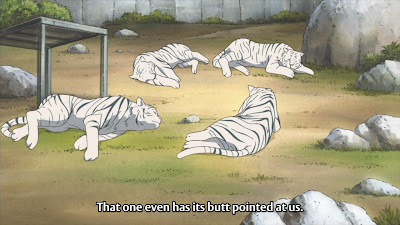 The random scene of the trio at a zoo, where the white tigers were lounging around and not "performing" reminded me of the visit to HK's Ocean Park. (We should have just gone to Disneyland instead...) I'm not that into amusement parks, having been dragged around by my parents enough in my childhood, but we ended up going for one reason or another. I was, however, extremely excited for the panda habitat, once I found out about it. There were three enclosures and three pandas. However, they were empty, as the pandas were in the back. We picked an enclosure near the end, away from the people, and I waited eagerly as the place got filled with food in anticipation of the panda's feeding time. As time went on, though, nothing happened. I watched the screen, and watched the panda leaving its backroom. ...but it didn't show up in the enclosure. wtf?! It was time to go meet up with the rest of the group, so I begrudgingly let Rho and Pearz drag me back into the blistering and oppressing heat. But, seriously, where the hell were the pandas? I swear, the CCTV was actually a live-stream from the Beijing zoo or something. The only bit with Nano-Professor-Sakamoto this week was Professor failing to get the laundry indoors before the rain began, while Nano was away at school. Her dilly-dallying (she had plenty of time to get the laundry, it looked like) caused Nano to claim that she wouldn't be getting dinner that night. (What a harsh punishment! I don't believe in punishing by taking away essential meals, by the way. Eventually, it stops having any effect and the kid just learns to live without proper food. True story.) Of course, Nano caved of her own accord by dinnertime, making omurice for Professor without even remembering her words. While she claimed that the punishment had been moved to the next night, it's pretty clear that it won't be. 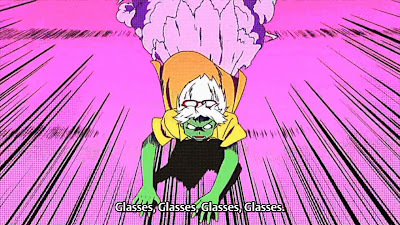 How will Professor learn this way?! My anguish is severe. The last scene for the comedy trio was getting caught in a downpour on their way to school, and hurriedly taking shade at the nearby temple. Yukko was the only one that had remembered that the assignment - a self-portrait as a clay bust - was due that day, and I think there was an inside joke about random rain beginning, like the "when pigs fly" concept we have in the west. I'm not familiar with this joke. 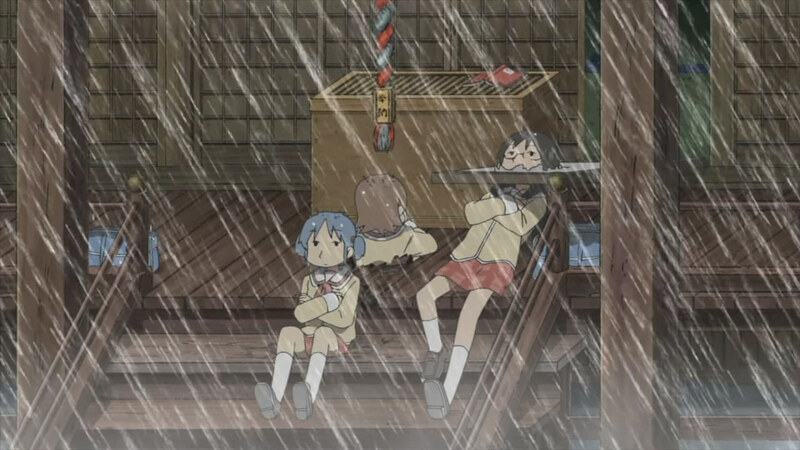 Either way, they accidentally brought bad luck to the temple, beginning with when Yukko's coin ricocheted off the wet book Mai had placed on the bars of the donation box and wedged itself between two floorboards. While I understand the priest's harried claims that the girls were harbingers of destruction, I personally think it was pretty cool. "Sho Ogi" in reference to shogi? 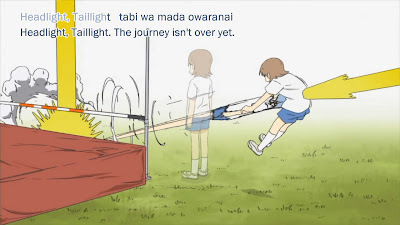 The last scene made fun of sports-themed anime unabashedly, led by the go-soccer match between Takasaki-sensei and Makoto, which Daiku had been asked to referee. 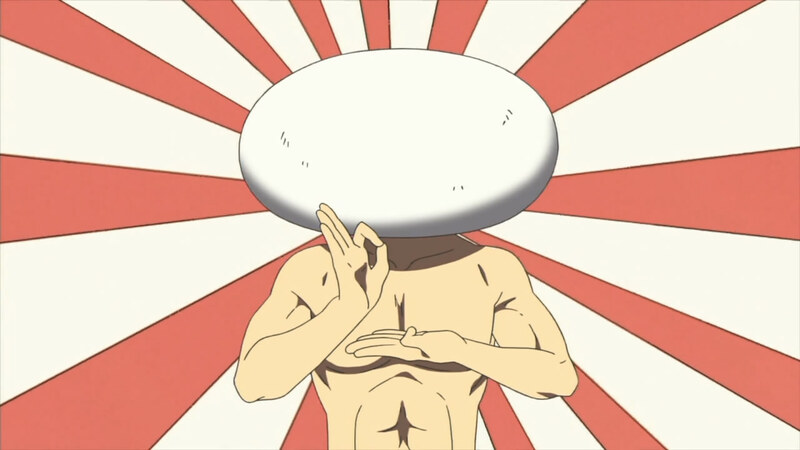 However, starting from the moment they began (Makoto doing a hand-stand with the soccer ball between his feet and Takasaki-sensei a Roman salute), it was pretty clear that Daiku (and I) would continue to be very confused. Ogi (who had, earlier, left the club) showed up to alleviate the confusion, as he knew about go-soccer, but he did nothing but worsen the situation. "Be loved"? "Final loved"? The scene did a good job of mocking over-the-top sports anime (like Hungry Heart Wild Striker and Prince of Tennis, for example). Quite notably, I have no idea who the victor was. With the end of the season in sight, the show doesn't look like it's really changing any time soon. I'll be happy with a tremendous final episode (like Sore-Machi), and I'm pretty sure I'll get at least that much.